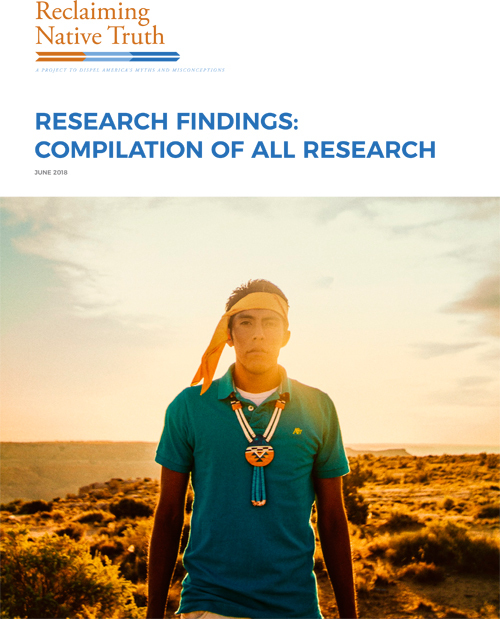 First Nations Development Institute (First Nations) and Echo Hawk Consulting (EHC) recently released groundbreaking research about attitudes toward and perceptions of Native Americans as part of a jointly-managed effort called “Reclaiming Native Truth: A Project to Dispel America’s Myths and Misconceptions.” The project also released two messaging guides based on the research findings and a narrative-change strategy framework that will be used to begin to change the false and misleading narratives about Native peoples. The project seeks to create a long-term, Native-led movement that positively transforms popular narratives and images of Native Americans. A two-year phase, launched in 2016, created a solid foundation of unprecedented public opinion research and data, building upon previous research efforts. It was funded by a $2.5 million grant from the W.K. Kellogg Foundation and significant financial contributions from numerous other entities and individuals. Discrimination: Most Americans surveyed significantly understate the degree of discrimination against Native Americans. Only 34 percent of Americans believe that Native people face discrimination. At the same time, myths about the abundance of Indian gaming and free government benefits to Native Americans are widely held and fuel bias across diverse demographics and within institutions. 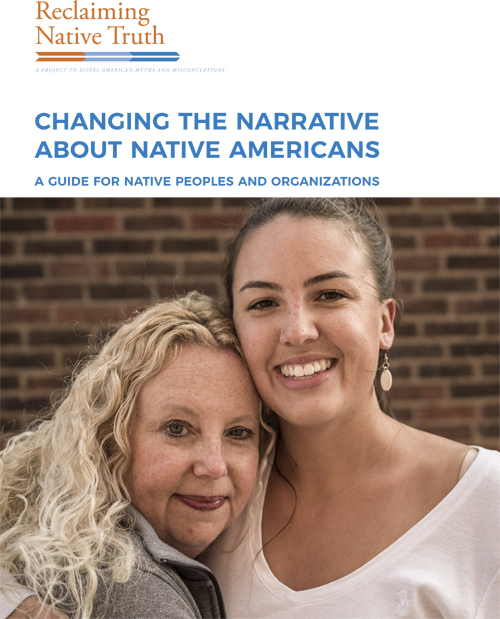 Narratives: The research found that people have limited personal experience with Native Americans but accept pervasive negative narratives that are erroneously set or reinforced by others, and that proximity shapes some perceptions. For instance, people who live near or work in Indian Country, especially in areas of great poverty, are likely to hold significant bias. Only 56% of survey respondents living in close proximity to Native communities believed the U.S. should do more to help Native Americans compared to 64% of respondents further removed. Invisibility: Unsurprisingly, another key finding was that Native Americans are assigned to a romanticized past. However, one of the biggest barriers identified was the invisibility and erasure of Native Americans in all aspects of modern U.S. society. Respondents, including members of Congress and administrative officials, agree that invisibility, stereotypes and narratives set by others do impact policy. Desire for Complete History: One of the key opportunities uncovered is that, across the research, people are well aware of the inaccurate historical lessons they have learned about Native Americans, and want more accurate education about both historical and contemporary Natives. This was reflected in national polling that indicated that 72 percent believe it is necessary to make significant changes to school curricula on Native American history and culture. 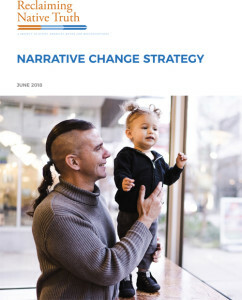 Narratives are broadly accepted, overarching stories that reinforce ideas, norms and expectations in society. Repeated over and over, through diverse platforms and channels, a narrative becomes the story people accept without question. Often a narrative reinforces the status quo and perpetuates unfair systems, structures and norms. 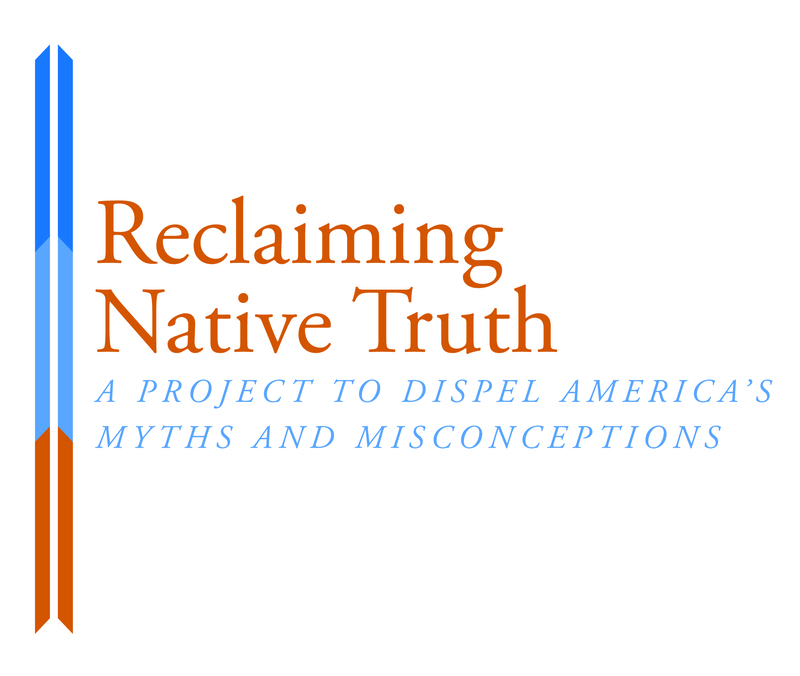 The Reclaiming Native Truth project worked to identify and test a new accurate narrative that can support cultural shifts to advance social and policy change to support racial equity and justice for Native Americans and tribal nations. 78% – Most Americans are generally open to hearing this narrative. A majority in this survey say they are interested in learning more about Native American cultures. Strong majorities support Native American positions on most issues — mascots excepted — without hearing the narratives. 81% – The public reacts strongly to our narrative. 88% – Nearly nine in 10 respondents find it credible. One of the most significant outcomes of the project related to developing and testing a new strength-based narrative that incorporated messaging related to values, history and the visibility of Native peoples. The narrative was tested through an online survey conducted between April 27 and May 1, 2018, with 2,000 Americans over age 18. Majorities of Americans support the new narrative and find it credible. A 65 percent majority say they would be willing — 31 percent very willing — to share these ideas with others. More issue-specific narrative messages written around key issues — mascots, the Indian Child Welfare Act, tribal sovereignty and pop culture depictions of Native Americans — find similar validation. Most noteworthy is the objective difference between those exposed to the new narrative (treated group) and those that were not (untreated “control” group). Large differences emerge among the half that read the new narrative, which gave them a framework for understanding information about key Native issues related to the Indian Child Welfare Act, sovereignty, mascots and other issues. For example, 39 percent of Americans who were not exposed to the new narratives support a ban on Native American mascots. Among those who read the narratives, 53 percent support such a ban. The next phase of work will focus on bringing the power of many movements — of organizations, tribes, grassroots leaders, non-Native allies, foundations — each of whom can adopt, adapt and disseminate the new shared narrative as part of their ongoing efforts and work, while leading implementation of their own priority strategies. An introduction to the narrative and messaging strategies are available as part of the Reclaiming Native Truth messaging guides at www.ReclaimingNativeTruth.com. The detailed research report and the Narrative-Change Strategy are also available online. Potential allies, supporters and others can partcipate in the movement of movements. The network will contain a support and infrastructure function that will be determined jointly by core organizations working collaboratively on the initiative. 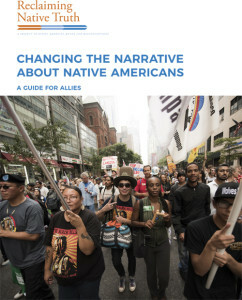 There will be many ways for allies to do their their part to shift the narrative, remove bias and barriers, and achieve the collective vision for the change that is sought: that Native peoples collectively author and powerfully lead a more equitable reality where they fully benefit from and contribute to both Native and American society. 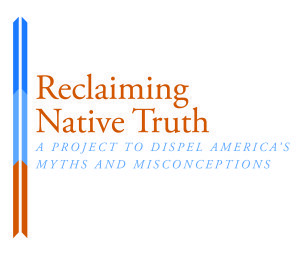 Interested partners are encouraged to download the messaging guides from www.ReclaimingNativeTruth.com. I worked in the Green Bay Catholic Diocese where we had five Native American tribes. I know of the racial bias. I also know the excellent efforts made and continuing to be made by the O’Neida tribe. I welcome this information and am passing it on to our intercultural committee in hopes that my community will become a partner in your efforts!